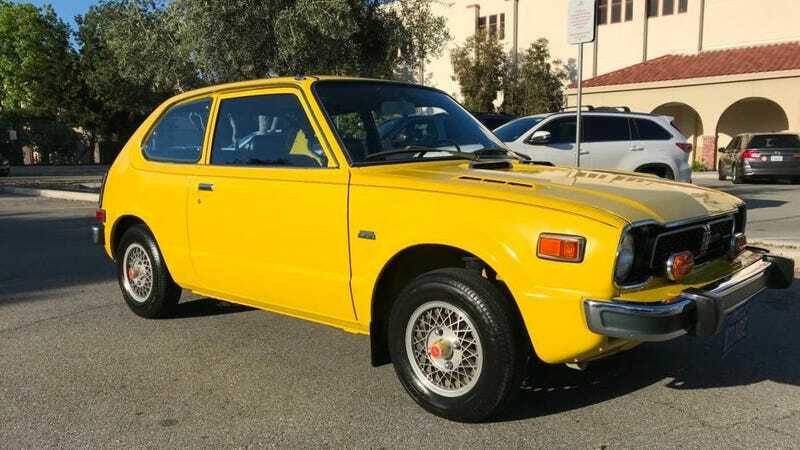 Will This 11,000-Mile 1975 Honda Civic Sell For A Bajillion Dollars? Low-mileage examples aren’t that unusual on car auction website and perennial Jalopnik staff time-waster Bring A Trailer. It’s pretty typical for you to see some mid-2000s Mercedes with 45,000 miles pop up on the front page. But this 1975 Honda Civic is truly something else. The yellow Civic you see above used to belong to the seller’s uncle, who purchased it, new, as a second car, but rarely drove it, according to the listing. When it wasn’t being used, it lived in a garage. With only 10,874 miles on the clock, the seller says that the car has only been driven 100 miles over the span of the last four years. It’s wild to see a humble commuter car from the ‘70s that’s been cared for at this level. It’s powered by a 1488cc CVCC four-cylinder engine, rated at 53 horsepower from the factory through a four-speed manual to the front wheels. And speaking of the wheels, the Civic also comes with magnesium ones! The current bid, at the time of this writing, is $6,800. It’s definitely going to climb from there. But for the happiest-looking Honda Civic that you’ve ever seen? That coat of sunshine yellow paint? Worth it.